Relevance The fluorescent Probe FITC-Trehalose is a fluorescent small-molecule probe to selectively label M. tuberculosis in culture and also in infected macrophages. In vivo applications These compounds are incorporated into the cell envelope of mycobacteria, via the extracellular Ag85-enzymes, providing a means of detecting live organisms. 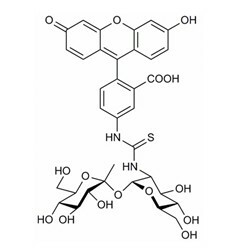 These are the first small molecules that can be used to label and image tuberculosis in a selective manner in vivo. Backus et al. 2011. Nat Chem Biol. 7(4):228-35. PMID: 21378984. Uptake of unnatural trehalose analogs as a reporter for Mycobacterium tuberculosis.